In Japan, knives are sharp when knife wholesalers like us deliver knives to retail stores, but the conditions are not completely perfect. Knives can become in perfect conditions after knife retailers conduct Honbaduke (Sharpening) on knives. Knives can become sharper and sharp for longer time by doing Honbaduke at knife retail stores. 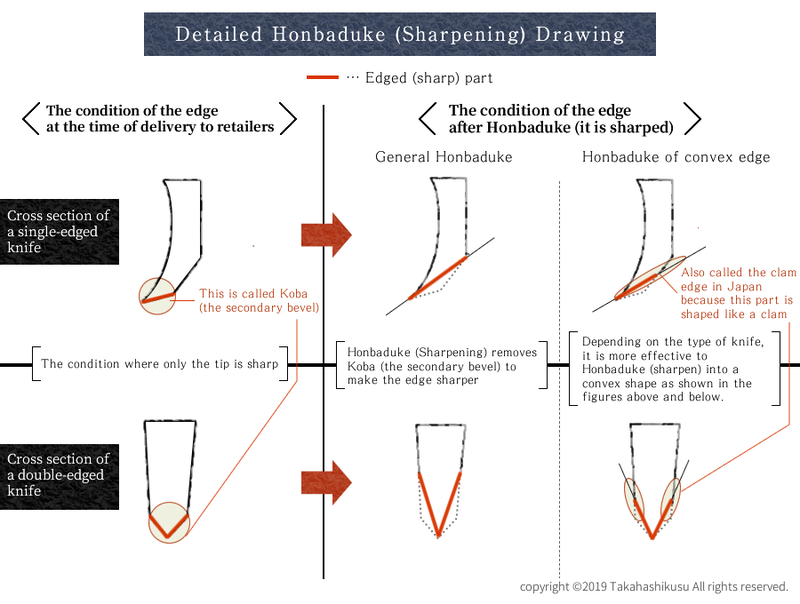 Let me explain about the drawing about Honbaduke (Sharpening) and convex edge. The upper part of the drawing illustrates single-edge knives and the lower part of the drawing illustrates double-edge knives. Then, the left part of the drawing illustrates the condition of a edge when knife wholesalers like us delivers knives to retailers. The central part of the drawing illustrates the condition of general Honbaduke and the right part of the drawing illustrates that of convex edge Honbaduke. The knife condition at the time of delivery to knife retailers has only Koba (secondary bevel.) In Sakai City, sharpeners deliver blades that have only Koba to wholesalers. (Wholesalers basically engrave logo and attach handles with blades.) Blades made in Seki City and Takefu have the same condition of knives when they are delivered to wholesalers. Knives are sharp at this condition, but after knife retailers conduct Honbaduke, knives can be sharper as the drawing illustrates and sharp for longer time. In the process of Honbaduke, like the repair of knives, coarse-grit grind stones are used for making rough shape of the edge and medium-grit grind stones and fine-grit grind stones are used for finishing Honbaduke. Some knife retailers use natural whetstones when they finish Honbaduke, fix the deformation of the edge, flatten Kireha (cutting edge) completely, and make the complete Urasuki (the mild concave on the backside of the knife which is vital to making a sharp single-edged knife) in the case of single-edged knives. We can say that such knife retailers are doing great Honbaduke, but this type of Honbaduke takes much time, so it will cost more. Next, Let me explain about convex edge. Honbaduke of convex edge means the condition of a edge at the right of the drawing. Honbaduke of convex edge is made when blades are tilted at the angle of more degrees than when general Honbaduke is made. As a result, the convex shape is made as the round highlighted area is shown in the drawing, so this condition is called Honbaduke of convex edge. Since the edge is tilted at the angle of more degrees, the edge becomes less sharp and sharp for shorter time than when general Honbaduke is made, although the edge is still sharper and can be sharp for longer time than the edge at the time of delivery to retailers. The most important feature of convex edge Honbaduke is that the edge is hard to be chopped. In other words, Honbaduke of convex edge is made for knives whose edges we would not like to be chipped, such as Deba, which is used for cutting something hard, such as bones. Some knife brands finish blades other than Deba with convex edge and we can say they take pride in the condition of the convex edge. No perfect single-edged knives can be made if either of 4 pieces, the skill of forging artisan, that of sharpener, that of attaching blades, and that of Honbaduke is imperfect. In other words, when these 4 skills are harmonized very well, the perfect knives can be made. Perfect double-edged knives can be made under the same condition. Honbaduke is very profound. Every knife retailer is particular about its unique points and there is no answer of correct Honbaduke. Therefore, it should be fan if you pursue Honbaduke.